The winners with Chief Guest P.N. Pestonjee and Chandana Perera , the Chairman of the Organising Committee of the competition, Thushara Sampath (Tournament Secretary - TTASL) and Prabath Priyantha (ITTF Umpire). some of the prominent players from well known schools in Sri Lanka. 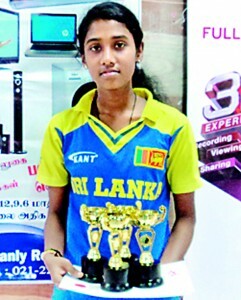 In the Under-21 final she beat Dilanya Munasinghe of Musaeus College Colombo by two straight sets while overcoming S. Nishanthini of Sundarapura Tamil Girls’ School Vavuniya by two sets to one to clinch the Under-21 singles championship. In the Under-18 singles final Sinthuya beat Ashinshani Pothuwila of Hillwood College Kandy comfortably by two straight sets. In the men’s segment Tharindu Perera of Isipathana College Colombo emerged as the Most Outstanding Player. Tharindu won the Under-21 boys’ singles and Men’s singles events. He beat S. Sajeewan of Central College Jaffna to win the Men’s singles by two sets to one but in the Under-21 Boy’s singles he took very little trouble to beat Gayan Sanjeewa of Gampola TT Academy by two straight sets. The tournament attracted 65 players from the Jaffna and 55 players from the Vavuniya districts in addition coaches, teachers and masters-in-charge of the schools and parents. All in all 432 players participated in the tournament from around the island. The key objective of this event was to give opportunities to new players, especially those from the Jaffna and Vavuniya districts to showpiece their talents and potential. Different categories for men, women and age groups of Under-8, 10, 12, 15, 18 and 21 were held over the two days. The non-ranking tournament was conducted by the Asian-German Sports Exchange programme (AGSEP) in collaboration with the Table Tennis Association of Sri Lanka (TTASL), Jaffna District Table Tennis Association and the Vavuniya District Table Tennis Association. The sponsorship for this event was spearheaded by Abans and the co-sponsors were Nilaveli Peace Village and Aquarius Beach Hotel.